Long before she thought of becoming a music historian, Mary E. Davis was a serious pianist. In her family home near Canton, she would practice in the evenings while her parents listened from other rooms. But sometimes, while she was playing, say, a prelude by Chopin, her father would appear in the doorway and suggest an alternative selection. "Can you play something that people like?" he would ask. "How about Honeysuckle Rose?" She could have taken offense, of course. (Her maternal grandmother had studied voice at Juilliard, and no one expected her to perform jazz standards.) But Davis obliged her father and learned to play Honeysuckle Rose. "It was a lot easier than Chopin," she recalls. "And it made me listen to popular music in a way I hadn’t before. There’s a lesson in that." Today, as the newly appointed chair of the college's music department, Davis is still applying that lesson. On the one hand, she is a scholar of European modernism in music and the visual arts, with two acclaimed books to her credit and a third, on Sergei Diaghilev's Ballets Russes, nearly completed. On the other hand, she is also the editor of a forthcoming book about Jimmie Rodgers, the country singer whose early synthesis of American folk traditions—of blues, spirituals and Appalachian hill ballads—made his work a precursor of rock and roll. 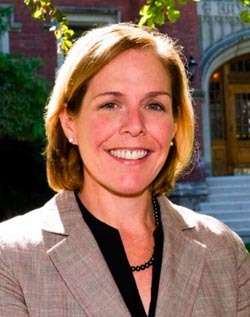 Since she joined the faculty in 1998, Davis has been the college's liaison to the Rock and Roll Hall of Fame and Museum, organizing the academic conferences that accompany each year’s tribute concert in the American Music Masters Series. In addition to Jimmie Rodgers, the series has honored such pioneers as Muddy Waters, Roy Orbison, Sam Cooke and Les Paul. Davis calls her annual immersion in a performer's life and work "an incredible learning experience." It allows her to relate music to social and cultural history, just as she does when she writes about Stravinsky’s compositions for the Ballets Russes. At the same time, it reminds her of the different ways in which music "takes on meaning" in particular lives. "For some people, the messages that come through in a Beethoven symphony or a Debussy piano piece are sublime to the extent that nothing else can approach them," she explains. "I see that. But I also see that a Beatles melody or a Sam Cooke lyric can touch you and alter your way of thinking. It's a different set of tools and techniques, but the goal is the same: to move people, to connect, and to change how we all see the world." That is what draws the crowds to Playhouse Square each November for the American Music Masters concerts. And it's what her father taught her when he looked in from the doorway and requested a song. Thinking back, Davis admits that her career didn't proceed in a straightforward way. That fact comes in handy when she advises undergraduates. "I can say to them: 'You don’t have to decide everything now. You don’t have to leave school knowing exactly what you're going to do. Your life from age 21 onward may take all kinds of twists and turns.' In my case, it all worked out. It all led to something." Her first venture into musicological research occurred while Davis was still an undergraduate herself. At St. Mary's College in Indiana, she helped one of her professors produce an edition of French Baroque trios, working from a manuscript in the collection of the University of Notre Dame. The project gave her an opportunity rarely available to college students—the chance to conduct research with original sources. But during those years, she was mainly committed to her performance studies. A pianist, she felt, is like an athlete: "You reach a certain level, and if you don't practice, if you let things go, you can't get back to that level again." Music history, in contrast, was a field she could always return to. From St. Mary's, Davis went on to earn a master's degree in performance at the Peabody Institute in Baltimore. At a certain point, however, she lost the motivation to continue playing. "My mother died while I was finishing that degree," she explains, "and it just didn't seem like a good use of time to be worrying about how hard I was hitting a key, or whether the phrasing in a particular melody was exactly right. I couldn't see how that mattered. I do now. But in that moment, in my early 20s, with this traumatic family event happening, I just couldn't see it." Davis left Baltimore for Washington, D.C., where she found work as a paralegal, reported on congressional hearings, and eventually became a tax lobbyist. After ten years, it was clear that she couldn’t advance any further without a law degree. But by then, Davis had decided to pursue a doctorate in musicology instead. "I had been out of things for so long, I was going to need another master's first," she recalls. So she enrolled in the New England Conservatory of Music in Boston, which offered programs in music history as well as in performance. "I worked intensively with a piano teacher on a very small slice of repertoire, so I got back some of my piano skills," Davis says. "And I learned some new music. But I also had the freedom to do research and to write a thesis. That thesis was on Erik Satie, because the largest collection of Satie manuscripts outside of Paris is in Boston, at the Houghton Library. And that became the basis for my Ph.D. dissertation at Harvard." Davis applied for a faculty position at Case Western Reserve before she knew very much about the music department. But she remembers her excitement when she came for an interview and learned about the many collaborations it had established or was ready to pursue. Through a joint program with the Cleveland Institute of Music (CIM), Case Western Reserve students take private lessons with CIM faculty, while CIM students take academic courses at the university. There were opportunities to interact with guest conductors and soloists performing with The Cleveland Orchestra; possible connections between the department's music education program and the Cleveland Music School Settlement; and, of special interest to Davis, the prospect of working with curators and educators at the Rock Hall. At that point, the department "hadn’t hired a full-time faculty member for a number of years," Davis recalls. "But it was poised for a change. And that appealed to me a lot." Davis's expectations for the department have been fulfilled. Over the past decade, the music faculty has doubled in size, building on its traditional strengths in early music while cultivating new fields of expertise. Francesca Brittan, the department's latest hire, specializes in 19th-century French music and aesthetics, but she also writes about the blues and early rock and roll. That is to say, her interests extend from Hector Berlioz to Elvis Presley. Davis would like to create a degree concentration in popular music, which she calls "the largest growth area in scholarship right now." It is hard to imagine a better place to launch such a program than Cleveland, where students could do original research in the Rock Hall's extensive archives. Meanwhile, the department's current offerings in music history and music education are attracting record numbers of students, including many who choose music as a second major while preparing for careers in other fields. All of these students perform in at least one departmental ensemble. Add the non-majors who also participate in instrumental and choral groups, and the total comes to 900 active student musicians. Davis acknowledges that the department outgrew its facilities long ago. When the symphony orchestra gives concerts in Thwing Ballroom, the players "practically fall off the stage." Practice rooms are scarce. Recognizing the shortage of rehearsal space on campus, the Flora Stone Mather Alumnae Association recently made a generous gift to convert a portion of Wade Commons for use by student musicians. As she looks ahead, Davis says that accommodating the department's expanding "programs, ensembles and faculty" will continue to be its greatest challenge. What about its greatest opportunities? As department chair, Davis is eager to develop new partnerships. She looks at the world music concerts presented by the Cleveland Museum of Art and contemplates building a program in ethnomusicology. She wants to engage with music students at the Cleveland School of the Arts, one of the specialized public high schools in University Circle. She hopes to develop faculty and student exchanges with Fisk University, the historically black institution whose "glorious musical history" began with the Jubilee Singers in the late 1800s. For Davis, such initiatives offer a chance to connect institutions, audiences and styles of music that are too often regarded in isolation. Imagine, she says, going to Severance Hall to hear Dvorak's New World Symphony. The melodies in that work are "tied to the music-making that was going on at Fisk in the nineteenth century." From Fisk, you can draw a line to the American musical culture documented at the Rock Hall, and from there to the contemporary world music performed in the art museum’s "Viva! & Gala Around Town" series. "If I have one vision for this music department," says Davis, "it would be that we somehow position ourselves at the center of those points, that we become a place where those connections can get drawn and made to resonate out into the community." 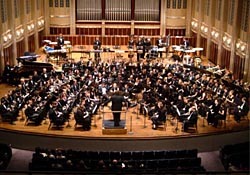 The Cleveland Institute of Music/CWRU University Circle Wind Ensemble performs at Severance Hall.